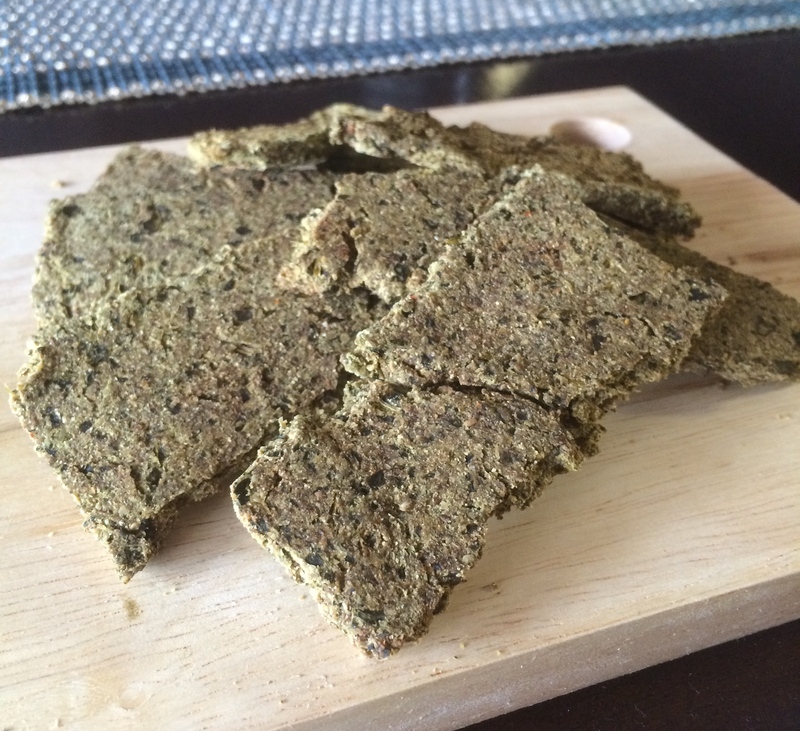 Last night I played around with making this Kale Cracker recipe I read on Pinterest. I do not own a food dehydrator, but now I want one! These came out so crunchy, and I love the seasonings I used. I followed the recipe as they said, but made a few substitutions. Months ago I tried a vegan version of creamed kale and it stayed with me – I really wanted to replicate the side dish. In usual fashion I bought too much kale recently and pondered what to do with it, so I decided to take a stab at it. I picked apart some recipes on Pinterest and came up with my own. In a medium sized saucepan, melt the cashew butter over a low flame – do not allow to scorch. Add almond milk and whisk mixture together until well incorporated and smooth. You can raise the heat to medium and add yeast flakes and seasonings – adjust to your liking. Personally, it needs a good amount of salt. Cool and set aside to use in recipes immediately, or you can refrigerate for up to one week – makes a great pasta sauce as well! Over high heat, heat coconut oil in a large, heavy bottomed skillet. Add onions and lightly saute, until softened and slightly translucent. 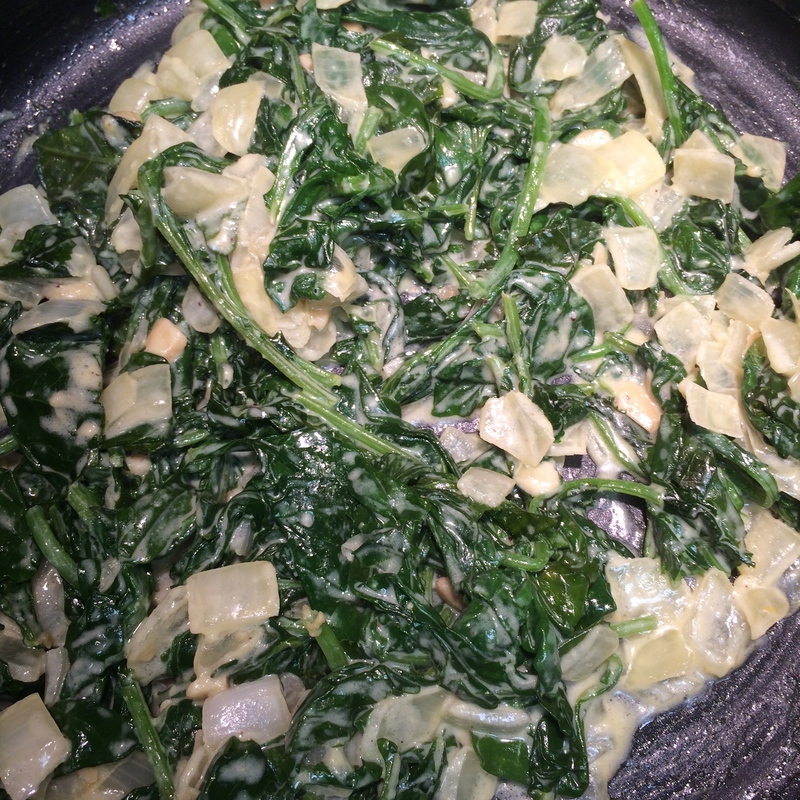 Add garlic and kale and mix with onion. Lower heat and cover skillet for about two minutes, allowing the kale to steam. You can steam longer if you prefer softer vegetables. Remove lid and add cream sauce, mix until all the kale is coated and hot, about one minute. Serve with your favorite vegan entree or just enjoy on its own! here in Hackensack. I highly recommend the restaurant, their food is amazing! I ordered the baby Pernil and got a huge shank. After amazing apps and salad and tostones I took most of the pork home, contemplating what I would do with it. I had a bunch of citrus fruit but I used it to make a batch of sangria. Rummaging through my fridge I came up with a plan – tacos! The sangria was going to give me everything I wanted in a braising liquid for the pork – wine to tenderize and lots of fruit and flavor! I poured about a third of a cup in a small skillet, shredded the pork off the bone, and cooked it covered over a low flame for about 15 minutes. I then uncovered it and raised the heat until the liquid evaporated. Meanwhile, I warmed corn tortillas with some cheddar Jack cheese in the middle. I then tossed some greens with a squeeze of lime (shamefully I picked the lime out of my sangria but it kind of worked!). Dinner, boom. With winter coming to a close (hopefully) I decided to give baked potato soup a whirl.﻿ Whenever I go to Houlihan’s it is my favorite soup to order but for some reason I never thought to make it. I looked up some recipes but I was not totally sold on anyone in particular so I modified and came up with my own. In all honestly I needed an excuse to use the grill press that I bought as my first employee purchase from Sur La Table. To make the soup I cooked about 11 slices of thick cut applewood smoked bacon and I reserved about a quarter cup of the bacon grease. I chopped one small yellow onion and threw in some garlic, seasoning the mixture with salt-and-pepper. After the onions got soft I added a few tablespoons of flour and started to create a roux. I then added 32 ounces of chicken broth and six chopped and peeled russet potatoes. I let the mixture boil then simmer about half an hour until the potatoes were soft. I then added a cup of warm milk (I was scared cold milk would curdle) and adjusted the seasonings. The soup definitely needed more salt because I forgot how much the potatoes absorb. I also added about a cup of chopped scallions and then my crumbled bacon which I had reserved on the side. That was pretty much it and it was really only about an hour for the whole process. Accidental Pantry Project = Huge Savings! I wish I kept better track on what I spent at the grocery store last year when it came to cash purchases. I know when I worked at Whole Foods Market I would buy lunch every time I worked a shift, which averaged out to about $10 a day. Now that I am working again, that kind of spending probably won’t disappear, especially as I now work in a mall with countless food options. In any case, just tracking grocery purchases for my home, last year during January and February, according to my credit card, I spent $240 at the grocery store. This year, being more diligent about my purchases, using what I had on hand as opposed to going for convenience, I spent $125 during the same period – almost half my money! To top it off, since I was not going to work for five weeks, I ate many more meals at home – so those savings not only saved me money, they stretched to twice the meals. I know not everyone has the pantry I had (I should say have – it is still valued at $759, currently (that is down from the $1140 that I started with)), but it is still important to know when you are sitting on money and meals at home. For five weeks, that is $381 I kept in my pocket, and not only did I eat like a queen, I fed others as well.